I’ve been hooked on Overwatch lately and there’s nothing like a beautiful environment that makes me want to dabble in 3D again. Using a few open source tools, I exported some models and textures for Reaper from Overwatch to play with. I quickly found that a decent amount of work was necessary to do what I wanted. With a lot of experience coming from the past few renders, I was able to generate this image with ridiculously less render time than when I was first playing with it weeks ago. While I didn’t think the last image benefitted from displacements, I love the look of it on this render. This is a rear view of the tower we’ve constructed, looking at it from a walkway to an unfinished pylon. 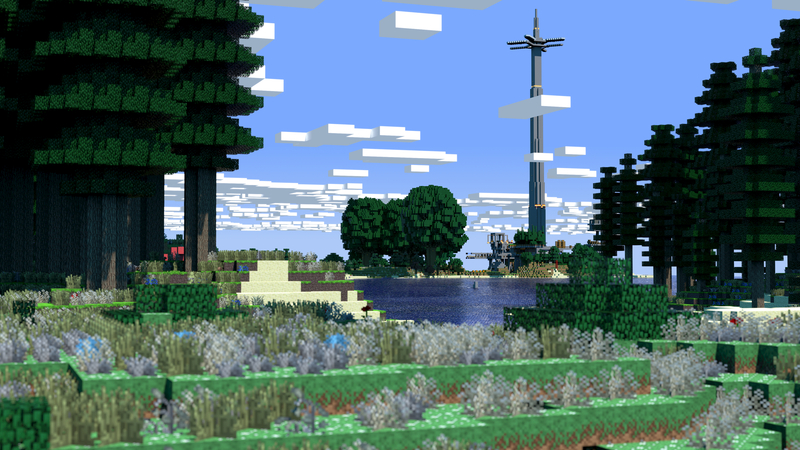 This is a somewhat closer view of that tower you might have noticed in the previous images. Most of our time has been spent inside or around the tower, which is full of machines, chests, and crops, so it’s nice to see views of it from far away. You might also notice many plants and blocks from Biomes-o-Plenty, an export made much easier by my DataDumper mod a few posts back. Although I tried to get a much larger export, my current limiting factor is actually how far we had explored in the world. Hello out there, it has been a while! More on that in a bit; first I want to introduce a mod that I’ve started for Minecraft which should interest anyone who likes to export their worlds for printing, rendering, or whatever else you might do with it. The specular layer represents the second layer of my uber-shader where the reflected light varies between rough and sharp. Reflected light can consist of light from punctual light sources, image sources, and/or reflections of other objects. In general, if the reflected light varies from different viewing angles, then the specular layer will handle those reflections.